When the Passover was around the corner, Jesus traveled down to Jerusalem. 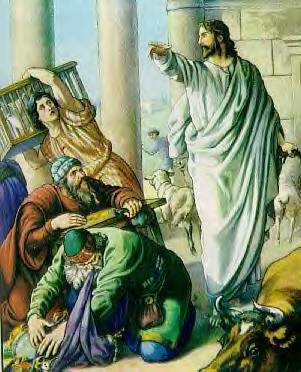 When Jesus entered the temple, He saw many people were buying and selling animals including sheep, oxen and doves, and the money changers were doing business there as well. Jesus grew angry. He made a whip from cords and He started to chase the people who are selling in the temples out. Jesus poured out the money of the moneychangers and overturned the tables they used for changing money. Jesus was talking about His preeminent death on the cross and resurrection after 3 days. After Jesus had died on the cross and risen on the third day, His disciples remembered what Jesus said. Jesus taught in the temple every day. The chief priests, the scribes and the leader of the Jews were jealous of Him and made plans to kill Him. But they couldn’t do anything to Jesus; because the people paid attention to what Jesus said and listened to Him.